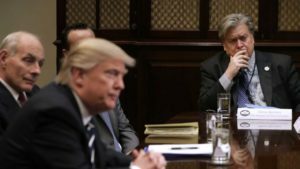 All week, DrudgeReport.com has conducted a death-watch on White House Chief Strategist Steve Bannon, and for weeks his imminent departure has been trumpeted by a Trump-obsessed national media. From Obama-era holdovers at the National Security Council (NSC) intent on short-circuiting his foreign policy to stock market unease over rumored upheaval in the Cabinet, President Donald Trump has been buffeted this week by storm winds from the “swamp” as the nation’s capital has become known by Trump’s supporters. All the President’s men, minus one: Chief Strategist Steve Bannon, right, has reportedly resigned. “Steve has been fighting tooth and nail on every internal policy debate and won more than he lost,” a Washington insider who has worked in an unofficial capacity with the White House this year told WorldTribune. “With Steve Bannon gone, we have nobody at the table,” he lamented. There remain some 40 Obama holdovers at the NSC, according to The Daily Caller. Some blame national security adviser H.R. McMaster for the holdovers. “He has protected and coddled them,” one former NSC staffer, who requested anonymity, told the Daily Caller. On Aug. 17, the Dow closed off 274 points at 21,750, its worst day in three months. Analysts say the markets are worried Trump’s top advisers and Cabinet members, key among them Gary Cohn, director of the National Economic Council and Treasury Secretary Steven Mnuchin, may be set to depart the administration which would be a major blow to Trump’s economic agenda, particularly tax reform. “For the first time, people are now questioning if he can get anything done policy-wise. His agenda is under threat,” said Peter Boockvar, chief market analyst at The Lindsey Group. Former Vice President Al Gore said in an interview published on Aug. 17 that if he could give Trump one piece of advice, it would be to step down. Gore was asked the question during an interview with the website LADbible. Meanwhile, columnist and longtime political operator Roger Stone, writing for the Daily Caller on Aug. 17, addressed the fate of chief strategist Steve Bannon. “I am one who had publicly defended Bannon from false charges of racism and anti-Semitism yet I have concluded he is a spent force, never being willing to spend his political capital to help his friends and in some cases helping empower the very globalists he claims to oppose,” Stone wrote.